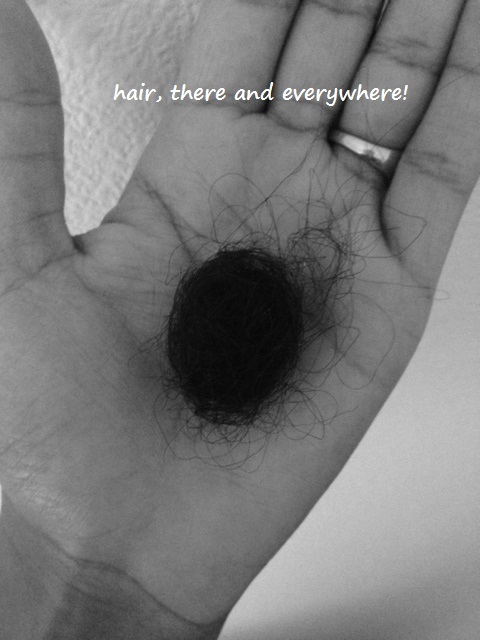 Alterna Caviar | hair, there and everywhere! Wash Day and now I am WL-Bound! It seems like yesterday (actually it was in the spring), that I declared myself MBL-bound after reaching BSL. I now feel quite comfortable claiming MBL length, so I am changing my status to WL-Bound! Yep … barring any setback, I am par to reach it in late spring/early summer, which is on par with the goals I set almost 2 years ago at the beginning of my HHJ. Well, it has been a while since I have posted a Wash Day post, but I thought that I would today! For the past two weeks, I have been pre-pooing my hair overnight. I use the same mix of cheapie conditioner, coconut oil and a ceramide oil (hemp or safflower). 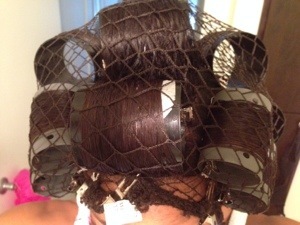 After I apply the mix, I apply my plastic conditioning cap and wrap it up in a dry turban to protect my bedding. It saves me an hour and with the length of time that it takes me to dry now, any minute I can shave off is welcomed. 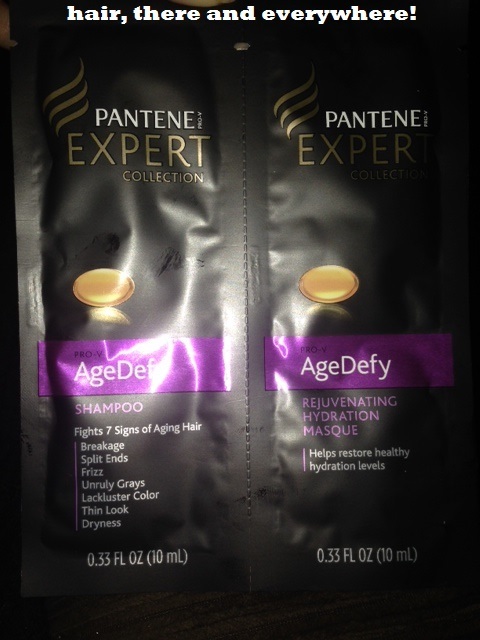 I received a sample of Pantene Age Defy shampoo and hair masque. To see how they performed, I just washed with the Pantene Age Defy shampoo (it has sulfates) and did my in-shower conditioning treatment with the hair masque and my Alterna Winter Rx oil. Meh … it definitely was nothing to write home about. I definitely will not be buying it. The best thing about them was the smell. While applying my deep conditioning (KeraPro this week), I noticed that my ends felt a bit bumpy, so I added my MegaSilk to the lower 3rd of my hair. I wrapped my hair in a wet turban topped of my a conditioning cap and sat under the dryer for 45 minutes. Afterwards, I was feeling tired, so I took a nap with my stuff on! So my deep conditioning session this week was about 2.5 hours. I then rinsed out, applied Roux Porosity Control for 2 minutes, then began to roll. My leave-ins this week were as normal: Alterna Caviar Photo Age Defense, Alterna Caviar Texture Cream, Carol’s Daughter Monoi Anti-Breakage Repair Spray and Carol’s Daughter Monoi Sacred Strengthening Serum. This week, I wanted a bit more curl so I decided to use the gray and purple rollers instead of gray and black! UGH!!! It took me longer to roll and honestly, it was weird using them all over my head again. It took me just under 2 hours to dry and even then, there were a few places of dampness that I zapped with the blow dryer. Overall, when I took my rollers out, I couldn’t tell if my hair was damp or just very soft (not good in my book). That brings me to my next observation: I need to assess the mixture of water I use to set my hair. I use a combination of water, glycerin and essential oils but last week I added some Roux 619 and a few drops of my Alterna Caviar White Truffle Elixir. On top of the leave-ins, I think that was wayyyyyyyyyyy too many products to have in my hair, which may be contributing to my hair drying so slow and it ultimately feeling a bit too soft and lank for my liking. Also, at the first sign of water, my hair just puffs up. My hair (relaxed or natural) has an almost cottony feel and I can only imagine the reversion nightmare I would have if I were to go natural. I think I need to eliminate the glycerin, since it can attract moisture to the hair, which is not what I need in Oregon’s damp fall and winter. Next week, I am just going to use some very diluted Lotta Body and water. That may make my hair dry a bit faster and make the curls have a bit more staying power. I combed my hair out, applied some serum and took a look at it. Meh. It looks OK! If my hair didn’t feel so soft and limp (despite me using smaller rollers), I would have just picked the curls apart and had some big hair! Instead, I wrapped it up for the evening and the proceeded to watch “John Adams” (one of my favorite mini-series)! I have also noticed something else about my hair that proceeds my HHJ days … I never liked my roller sets the day I got them done. I always felt a good sleeping on the curls did my hair wonders! Day 2 and 3 hair is way better than Day 1 when it comes to roller sets, IMHO. I think it’s because the oil has had time to spread and make hair a bit shinier! I don’t know!! Happy 2013 (and a Wash Day)!!! I decided to use this day off (ugh, can I get about 10 more of these?) to wash my hair, as it has been since its been about 10 days since it’s been washed! I started off with a pre-poo of a hot oil treatment on the scalp and cheapie conditioner, honey and veggie glycerine on the length of my hair. I left it on for about an hour and then washed. Since I had my hair flat ironed and used a silicone product, I did a light clarifying session with my Alberto V-05 Strawberries and Cream shampoo, followed by my Alterna Caviar moisture shampoo. 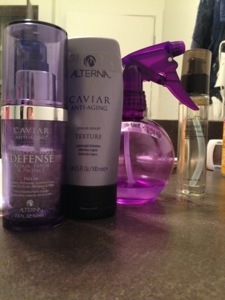 I put on the Alterna Winter Rx Thermal Oil for about 3 minutes, rinsed, then followed up with Caviar conditioner. I deep conditioned with my Silk Elements MegaSilk for about an hour. Instead of getting under the dryer, I sat on the couch with my turban and my phone, talking with a friend. I switched up my final rinse routine, as recommended by The Science of Black Hair. Instead of leaning over the tub where my hair is flipped up, I got back in the shower so that my hair stayed downward so that cuticles could close. I did my Roux for 2 minutes, then rinsed with cold water. I must say, it was annoying hopping back in the shower, but I guess I will have to do it! Today I wanted big, fluffy hair, so I decided to air dry. I applied my normal leave-ins and went ahead a sealed the moisture in with Vitamin E oil. 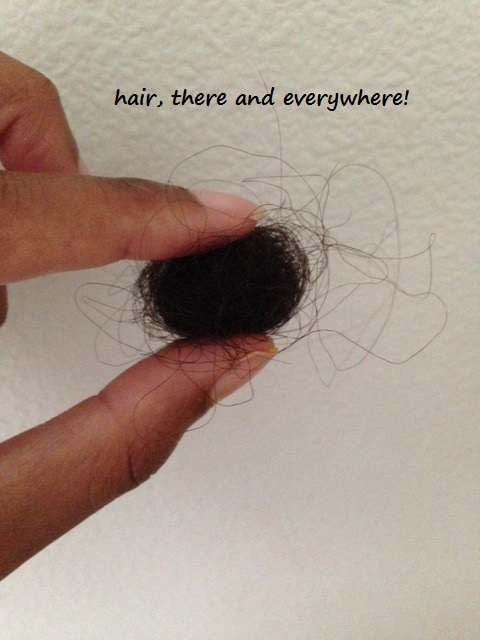 Now peep this … my hair, for the most part (sans the ends) are medium to low porosity so it takes forever to airdry. After about an hour of little results, I sat in front of our heater and let it blow on it. I was not worried, as I had thermal protectant on! In about 10 minutes, I was dry! I took out my blow dryer with the diffuser attachment, blow dried on cool to seal the cuticle. I followed with a bit of Alterna White Truffle Elixir and kukui nut oil and I was done! So what will I do with this hair? I plan on bunning it, wearing it in a ponytail … whatever my heart’s content. 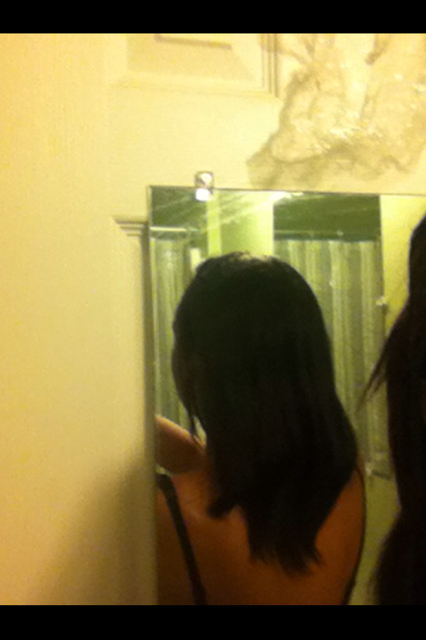 After looking at my flat hair for the past week (I hate how flat ironing your hair leaves it like that! ), I am just eager to see a bit of volume! 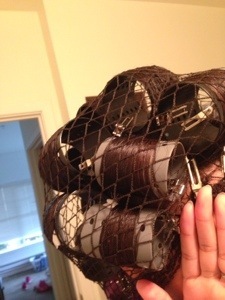 I am debating on using this method until my next relaxer late February. I know I will rollerset when Nathan’s dad comes into town next week, but I may have to hang on to this for a while!! Here’s t0 continued growth and health this 2013!!!!! 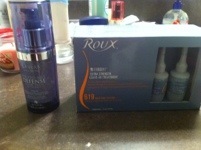 Today has been a great day for hair products! Nathan and I went to Best Buy for some Blu Rays and of course with me being so close to Ulta, I could not not go in. I am at the bottom of my Alterna White Truffle Elixir, so I needed to break down and buy some more from the store and not the watered-down mess I bought from Amazon (read about it here: https://hairthereeverywhere.wordpress.com/2012/11/30/is-this-an-orphan-blog-nah-i-am-back/). I could not find the Alterna products as they had moved, but I did stumble upon the Alterna Winter RX Thermal Oil (http://www.folica.com/hair-care/hair-treatments/alterna-winter-rx-thermal-treatment-oil). They had this stuff last winter, so I am not sure if it is the product that did not sell, but it was priced at an unbelievable $4.99, so regardless of how old it was, I was buying it. I knew Ulta liked to mark things down and since all of a sudden, the White Truffle Elixirs were gone (there are always plenty when I shop at any other time), there had to be a few on the clearance rack across the store. Sure enough, my wishes came true. There were 3 White Truffle Elixirs: one with its nozzle on correctly and the other two with either a missing nozzle or one slighty detached. At first I picked up 2. Then I remembered how I am still kicking myself for not buying the extra Alterna Life Scalp Therapy shampoo last year, so I scooped up all three of them. They were marked down to $13.99, 50% off their original price. I was stoked. Now I do not have to worry about buying any of this stuff for the next year or so, as each bottle lasts me about 4 months. I did ask the cashier if Alterna was discontinuing this stuff and she said they may just be changing the bottle or packaging (as they have with the shampoo and conditioner recently). I hope so, because I love this product … but I have a year to figure an alternative out! Nathan needed to run to Game Stop, which is right beside Sally’s. I promised myself I would not go in, but at the last-minute, I thought about trying KeraPro. I have seen people rave about it on blogs and it was all of $5 on sale (normally it’s like $11). They had one left. I asked the girl about it and she said that it flies off the shelf. Hmm … I guess white people are up on the KeraPro game, too, I thought. And finally, my Alterna Photo Defense and Alterna Texture has come in from Amazon, so I am set for a while. 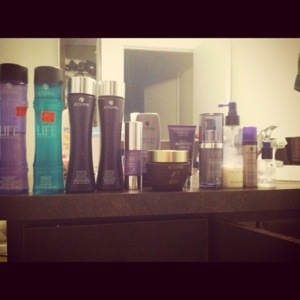 I will buy some Alterna shampoo and conditioner in early 2013. Well, I am off to do my hair today. It is Saturday and I want Sunday to rest and relax. Nathan is sleeping so it is a great time to do some hair! Well, I got my relaxer last Tuesday, but since I have been on the go since I arrived in NC … I have not even had a chance to take a pic nor post about it. I leave tomorrow morning, so I thought that I would burn the midnight oil (literally, its after midnight here) and write about it. 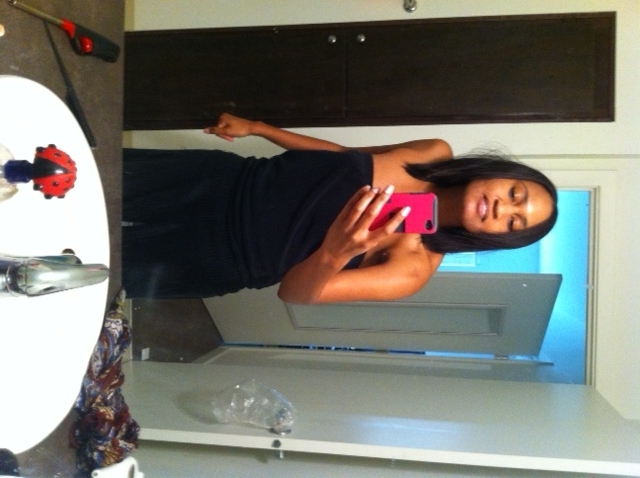 As I noted last post, I washed my hair Sunday and got a relaxer Tuesday … that was a bad idea. My head burned so bad, I had Kim wash the relaxer out early! It’s not so much a bad thing, as my hair was processed enough anyways … but now I have some scabs. Ah, the joy of relaxing hair. 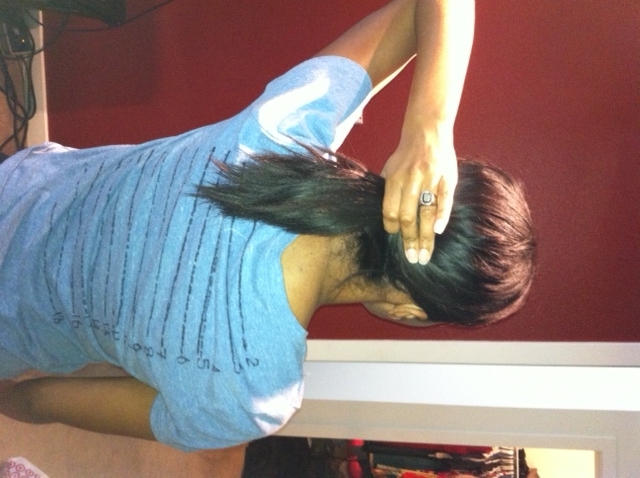 Before putting the relaxer on, I covered my processed hair with cheapie conditioner to prevent double processing. 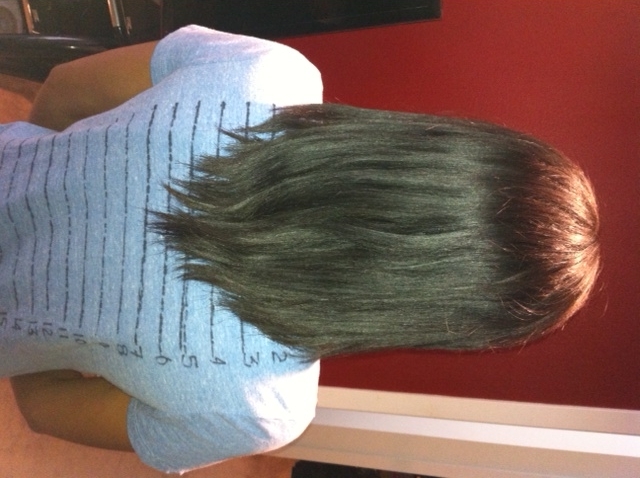 After the relaxer, Kim washed with neutralizing shampoo, followed up by my Alterna Caviar shampoo. I deep conditioned for 15 minutes with Alterna Caviar conditioner and Alterna 10 Hair Masque followed by a final cold rinse with Roux Porosity Control. The leave-ins were my typical leave-ins. Kim blow dried and flat ironed my hair and it looked amazing!!!!!! I was so impressed! I can tell a radical length change from my relaxer in May to the one in August. Well, my joy was short lived. I am not sure if my hair was not dry enough or the NC humidity was too strong, but by the next day, my hair was a swollen mess. I had to go to my friend Scott’s house in Morrisville to co-wash and blow dry it so that I could get it flat ironed at the Walmart salon! I had some important outings and I had to look fly. I apologized to my hair for the heat overload, but made sure that it had plenty of heat protectant on it. This style has lasted all week. I wonder if it is because I used the cool shot on the blow dryer to “set” the style. 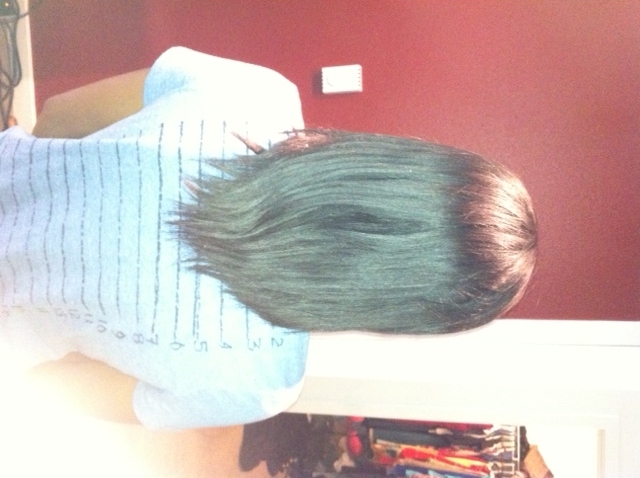 I made it past the 7 in the longest layers … which was my goal for this relaxer cycle. I will post pics when I get home tomorrow evening! I am really proud of my hair. I have gotten a lot of compliments on its health and how long it is getting!!! I am closing in on BSB. That shoulder blade is getting close to being covered!! I think that I will be BSB by October. I don’t think that I will be BSL by my next relaxer in late November … but if I can get 1.5 inches, then I will be darn close! Here’s to healthy hair growth and length retention! Sorry for the picture without the length check shirt on. I will take one soon! Well, I could not take it any longer. I had not seen my hair straight for a month (I like my hair straight) and I wanted to make sure that the dusting that I gave myself did not jack my hair up. I should have had my hair straightened before I dusted, but hey … no harm, no foul, right? I made an appointment at Ulta on Saturday for Sarah to flat iron my hair. That morning, I pre-pooed with a hot oil treatment under the dryer for about 40 minutes. I applied the oils to the scalp as well as to the length of my hair. I did not apply any conditioner. I then proceeded to wash with a sulfate shampoo because I saw where the Alterna Overnight Repair contains dimethicone (that is a water insoluable silicone which can eventually damage your hair if you do not clarify enough or use sulfate shampoos), followed up by the usual Alterna moisturizing shampoo and conditioner. I deep conditioned with the Alterna 10 Hair Masque, Alterna Caviar conditioner and a tsp of Roux Porosity Control for about 45 minutes, followed by a final rinse of Roux and cold water. I then proceeded to detangle and apply my normal leave-ins for a blow out. 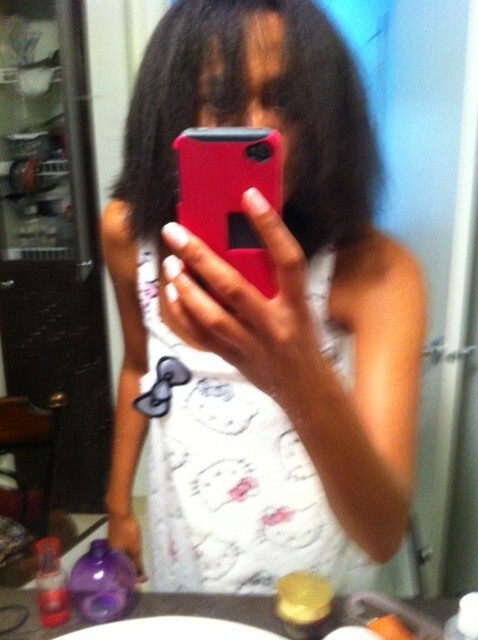 I blow dried my hair on cool and low (sigh, I have gotten lazy … I didn’t enjoy this at all!). I must say I was sooooooooo impressed with how thick it was!!!!! See?? I applied a little bit of grapeseed oil (for its thermal protectant properties), tied it back and headed to Ulta. The flat ironing process was as usual! Hair turned out very nice! Sarah commented on how healthy it looked and what a decent job I did on dusting my ends! I have not been complemented for the health of my hair for as long as I can remember (if ever), so it was great to have my hard work validated! Well, it has grown! Progress is continuing to be made! I am between the 6.5 and the 7 on my shirt … whoop whoop! I am also glad that I have a baseline in which to work towards my relaxer goals next month. I am still wanting the longest point to be at the 7 (or a little past is fine), but I am still going to be working on growing out the front and side layers with the JBCO challenge! I have a month … I think I can get a .5 inch of growth in! So after enjoying wearing my hair down this weekend … tomorrow it is back up in the protective styles. Also, no more heat until the relaxer in 4 weeks!!! Today was the first time i have bought new hair products in a good while (so proud of myself!!) Now that I have a routine and products that I like, it’s easy to go a few months without buying stuff! Today I went to Sally’s an got some Roux 619 vials. Thank heavens it was buy one get one free! That stuff is pricey! I probably will go back May 31st and get some more, just to stock up. They come in a pack of three vials, but I combine all of them in a spray bottle. It makes the product stretch a bit further. I also got a 2 minute Aphogee keratin treatment packet. Uh, that stuff has gone up in price, as well as well as the hard protein treatment. Each packet lasts me about 2 applications, so I will buy another one in a month or so. 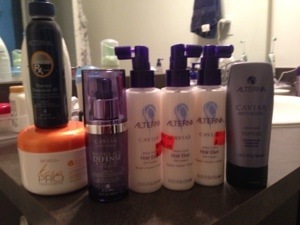 The big purchase of today was a new Alterna Caviar product. I had a coupon at Ulta for 20% of one item, so I had to be wise. It was between the truffle elixir, which I use to M&S my hair or the Photo Age Defense. I talked to Sarah, my new stylist, and she recommended me try it. Read about it here! I am excited to try it! Hopefully it will help me maintain my ends, which is the biggest goal I have. I am all about retaining length this summer!! I will write a review about it when I use it next wash day.